AND THE ONES YOU LOVE 10- AND 20-YEAR LEVEL TERM LIFE No matter where you are in life, SCCMA/MCMS Group Level Term Life Insurance beneﬁts can be an affordable solution to help meet your family’s ﬁnancial protection needs. Mercer and SCCMA/MCMS leveraged the buying power of your fellow members to secure dependable and affordable life insurance beneﬁts at competitive premiums from ReliaStar Life Insurance Company, a member of the ING family of companies. With quality life insurance beneﬁts extended at competitive rates, you’ll rest easy knowing you’ve provided coverage for your loved ones through the Group 10-Year and 20-Year Level Term Life Plans. See For Yourself: Get more information about your Group 10-Year and 20-Year Level Term Life Plans, including eligibility, benefits, premium rates, exclusions and limitations, and termination provisions by visiting www.CountyCMAMemberInsurance.com or by calling 800-842-3761. Insurance is provided by ReliaStar Life Insurance Company, a member of the ING family of companies. 65595 (3/14) Copyright 2014 Mercer LLC. All rights reserved. Mercer Health & Beneﬁts Insurance Services LLC • CA Ins. Lic. #0G39709 777 S. Figueroa Street, Los Angeles, CA 90017 • 800-842-3761 • CMACounty.insurance.service@mercer.com • www.CountyCMAMemberInsurance.com * The initial premium will not change for the ﬁrst 10 or 20 years unless the insurance company exercises its right to change premium rates for all insureds covered under the group policy with 90 days’ advance written notice. The County Medical Associations & Societies receive sponsorship fees for insurance programs that offset the cost of program oversight and support member beneﬁts and services. 22	Is There a Misperception of the Risks of Tonsillectomy? findings related to delivery system changes. Some of these findings are from the so-called Oregon Medicaid Experiment, where a Medicaid lottery allowed a randomized, controlled experiment of insuring previously uninsured adults. While this study found some positive effects, it also found that emergency department use by the insured increased 40% in comparison to the control group, health expenditures increased, and overall physical health was not improved. These findings were in stark contrast to those expected from the change in insured status. A recent New England Journal of Medicine article dashed a similar dose of cold water on the patient-centered medical home concept with an article entitled, “Almost No Benefit of Medical Home Interventions in Community-based Practices.” I’m not quite sure if this is a medical reversal or the initial, uncontrolled, study, but these types of findings are especially troubling because system delivery changes affecting millions of people and costing billions of dollars are routinely implemented with even less evidence of likely positive effects than practices subject to medical reversals. About 35 years ago, I read an essay by British astronomer R. A. Lyttleton in The Encyclopedia of Ignorance in which he proposed a mental model to be adopted in evaluating any hypothesis, which includes all of the above situations. He suggested that one think of their belief in a hypothesis as a wire with a bead on it, with one end of the wire representing certainty that the hypothesis is true (1) and the other end representing certainty that the hypothesis is false (0). His advice is, “Never let your bead ever quite reach the position 0 or 1.” He says that is when the bead falls into the emotional pit of pride and prejudice and it cannot be recovered. Our Bayesian friends would put it more formally and quantitatively, but I take their point to be the same. When we become too certain of our ideas, we fall into a frame of mind that does not do justice to the fundamental uncertainties of our ability to understand the world. Somehow, it seems to me that that degree of skepticism would be very helpful in avoiding some of the errors that clinging too tightly to positions informed by p<0.05 evidence, or worse yet, no evidence at all, brings us. Our physicist colleagues seem to be able to make do with waiting for p<0.0000003 results to declare adequate certainty. Although human variability and a need to bring diagnoses and treatments to patients in a timely fashion, undoubtedly, make waiting for five sigma significance unrealistic, could we strike a better balance? Is this part of the meaning of, “First of all, do no harm.” That seems to me to be a sensible interpretation. But I have to admit, I am not certain. sumers of pain medications. While the U.S. makes up only 4.6% of the world’s population, we consume 80% of the world’s opioids and 99% of its hydrocodone, which is found in Vicodin. The spillover beyond medicine is significant. According to the White House, nearly a third of people using illicit drugs for the first time began by using a prescription drug illegally. Hence, it is imperative that the medical community comes together for the sake of protecting our patients. To begin with, we need to use opioids based on evidence-based principles which have shown that they are effective in treating acute pain, and pain during terminal illness. Physicians need to assess whether patients are at risk for drug addiction, abuse, or overdose, and prescribe the appropriate amount of opioids for a particular medical condition. For instance, if a patient’s pain is expected to resolve after three days after a procedure, then giving the patient a three-day supply of opiods would be prudent, instead of a 100-day supply with multiple refills. Opioids are powerful drugs Sameer V. Awsare, MD, FACP, is the 2013-2014 president of the Santa Clara County Medical Association. He is a board certified internist and is currently practicing with The Permanente Medical Group in Campbell. and should be avoided in conditions like axial low back pain, fibromyalgia, and headaches, where they have not shown to be effective. Physicians and patients should be aware of the 90-day cliff, since people who use opiods continuously for more than 90 days are likely to use them for the rest of their lives. People taking over 100 mg of morphine equivalents are at highrisk of overdose. This risk of overdose and death significantly increases when people take medications like muscle relaxants and benzodiazepines along with their opioids. We also need to acknowledge that some patients who are addicted to opioids might try to take advantage of the health care system and extract prescriptions from multiple providers. While some integrated health care systems with electronic medical records can look for signs of this type of gaming within their system, it is only through utilizing broader statewide or regional systems, like the Controlled Substance Utilization Review and Evaluation System (CURES) database set up by California’s Department of Justice, that providers can be certain to have a full picture of all the various opioids that their patient has been prescribed. The most recent California data shows that only 9.5% of eligible prescribers are even registered on CURES. In order to stop the epidemic of prescription opioid overdoses, we must educate physicians regarding the optimal management of patients on opioids, and build the necessary infrastructure to support them in: •	Weighing the risks/benefits of long-term opioid use as part of a broader multi-modal treatment plan, •	Ensuring that opioids are prescribed for patients with conditions shown to respond well to them, and in the appropriate dosages, •	Monitoring patients for signs of side effects and for abuse, and •	Ensuring that patients who are starting long-term opioid therapy are aware of the risks inherent in long-term use. We owe it to our patients to stop the swinging of the pendulum and need to work together to stop this growing epidemic. We must make sure that every patient with pain receives compassionate and appropriate treatment while doing our best to ensure their safety and protecting their lives. was on a Virgin America flight bound for Florida. A Northeasterly wind whipped across Biscayne Bay, as I drove across a bridge bringing me to the Miami Rowing Club. With a setting sun, I arrived just in time as sailing coaches Ian Andrewes and Jonny Goldsberry were stowing gear at day’s end. “It’s pretty windy today from a low pressure system passing through. Hopefully, the wind will moderate a bit tomorrow for your first lesson. See you then,” Ian replied, as I departed. Indeed it was windy the next morning, with gusts sending darkened ripples and whitecaps in a chaotic dance across the water. “Steady 22 mph with gusts to 28 mph,” I called out while reading a wind meter app on my smartphone. “Let’s go get lunch at this great Cuban café and check back after lunch,” Ian suggested. It sounded like a great idea as I nervously eyed the 62-pound narrow carbon fiber hull, bounded by small trampoline seats on each side and sharp wing-like foils underneath. In fact, the Mach 2 Moth looked more purpose built for flying than floating. That afternoon, the wind subsided a bit and I donned a shorty wet suit, gloves, and booties and jumped into a small RIB powerboat that took us out in a more central part of Biscayne Bay. The setting was spectacuJoseph S. Andresen, MD, is the editor of The Bulletin. He is board certified in anesthesiology and is currently practicing in the Santa Clara Valley area. lar as downtown Miami high-rise buildings peered directly at us in the distance. I stepped carefully off the RIB into the cockpit of the Moth and it immediately rolled over, capsizing. The sudden shock of being immersed in the water caught me by surprise, but was much warmer than I expected, as I hung on to the side of the boat. “Grab the mainsheet and slide back on,” Ian shouted from the RIB. I pulled myself up and grabbed the line attached to the boom, controlling the sail. Suddenly, the Moth came to life and I hung on, trying to balance on this knife’s edge. A brief puff of wind filled the sail and over I went, falling back into the water on the far side. I tried fruitlessly for the next hour to find some point of equilibrium in this small and unforgiving vessel. Recognizing my complete fatigue, Ian came to my rescue. I barely found the strength to climb back inside the RIB for the ride back to the rowing club. “Don’t be discouraged,” Ian advised. “We all find this boat a real challenge to learn how to sail. I still do after six years and as a prosailor. That’s what makes it such a rewarding challenge.” The second day came quickly despite protests from my body. Sore yet undeterred, I was ready to go. “Hey, look at Cooper. He’s up and foiling on his first day!” Cooper was a teammate of Ian’s during the 2013 Red Bull America’s Cup event. The Moth had risen out of the water and was flying toward the horizon. An hour later, I was wet, exhausted, and no closer to successfully staying upright and afloat for more than a few moments. “Use your weight more aggressively and find your balance,” Ian urged me as we began our third day on the water. It was a bright and sunny morning with a brisk, easterly wind. The small, light boat felt like a bucking bronco, flipping over repeatedly when I failed to quickly grab the reins (mainsheet) in time. “Joe, get your feet under the strap. Here comes a puff….ease, ease…good balance,” Ian called, as he rode nearby me keeping pace in the small powerboat. I began to move faster as the water rushed by. “You’re foiling! You’re foiling!” I heard a voice behind me yell. Suddenly, the sound of rushing water disappeared and I felt myself flying over the water, accelerating at a faster and faster rate. It was as though I was weightless, hurtling through space. And as soon as it began, the boat took an abrupt dive and my brief flight came to an end, crashing, bow first into a wave a meter below. “Good job. Good way to end the day,” Ian exclaimed, as I bobbed on the surface of the water with the overturned Moth a few feet away. After three frustrating days, I finally found the proper balance that propelled me over the water for those brief moments. I left Miami and headed home with much to share with family and friends. It was time to return to my professional life, but with a surprisingly renewed energy. And now I have a much deeper understanding and humbled respect for those who sail over the water, rather than in it. A renewed equilibrium and the many paths that lead to it were the take away lessons for me. Finding this balance allows us to bring our best to patients, family, friends, and most importantly, ourselves. The following is a video link for my article that may be of interest: http://youtu.be/vs6LOPoAOF0. because they polled well and are the “ultimate sweetener.” With these signatures submitted, the fight to defend MICRA begins in earnest. California physicians must stand together in opposition of this ballot measure! The California Medical Association (CMA)-led coalition working to protect MICRA has published a patient education brochure to help inform California voters about the ballot initiative being pushed by trial attorneys. The pamphlet, available in English and Spanish, can be distributed to patients during office visits and will be accompanied by talking points for physicians so you can have meaningful conversations with patients on the real impacts the proposed ballot measure would have, if passed. There is no doubt that physicians understand how catastrophic a measure like this would be for access to affordable health care. To win this fight, voters, your patients – those you interact with everyday in your practices – must understand the fact that protecting MICRA goes handin-hand with protecting access to quality health care in California. If you would like to receive brochures for your office, please contact Yna Shimabukuro at yshimabukuro@cmanet.org or 916/551-2567. For more information on the proposed initiative, as well as how you can help defeat this ballot measure, please visit www.cmanet.org/micra. SCCMA-MCMS/CMA extends a huge thank you to the many members listed below who have already made generous contributions to CALPAC for the 2013-2014 fiscal year (as of March 27, 2014). SCCMA-MCMS/CMA genuinely appreciates your commitment to defending and protecting MICRA. Every physician in California owes a “thank you” to the CALPAC donors listed below for assisting the California Medical Association’s Political Action Committee in protecting and defending MICRA. 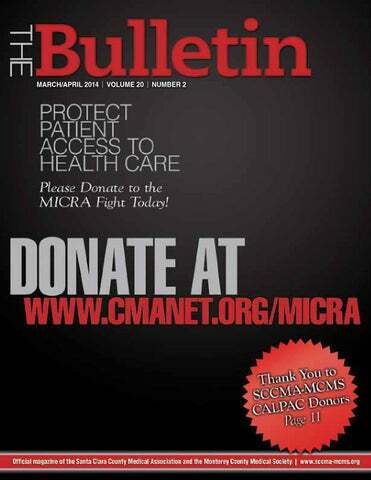 All members are strongly encouraged to contribute to CALPAC at www.cmanet.org/ micra. All contributions are appreciated! We thank you in advance for your contribution. YOU MAY BE AWARE OF A TRIAL ATTORNEY-SPONSORED BALLOT MEASURE THAT WOULD UNDERMINE THE PROTECTIONS AFFORDED TO PATIENTS ACROSS CALIFORNIA AS PART OF THE MEDICAL INJURY COMPENSATION REFORM ACT (MICRA). the proposed November ballot proposition. Visit www.cmanet. fight and how to get involved. Community health care clinics, like Planned Parenthood, say this measure will raise insurance costs that will cause specialists, like OB/GYN’s to reduce or eliminate services to their patients. taxpayers. If medical malpractice awards increase, government costs will increase too. Somebody has to pay, and that will be taxpayers through higher taxes and California citizens through higher health care costs. NOT ONLY WOULD THIS MEASURE COST patients across the state, it’s a misleading measure intended to fool voters. everyone, not increase lawsuits and payouts for lawyers. services will make a bad situation worse. Congress Passes California Medicare GPCI Fix, ICD-10 Delay, and SGR Patch On March 31, the U.S. Senate passed the “Protecting Access to Medicare Act of 2014” bill to postpone for one year the 24% cut to Medicare physician payments as called for under the fatally flawed sustainable growth rate (SGR). The bill (H.R. 4302) was signed into law by the President on April 1. The bill, which already passed the U.S. House of Representatives last week, provides a 0.5% physician payment update through December 31, 2014, and then a 0% update until April 1, 2015. On a bright note, the patch bill does include the California Medicare locality update, known as the California geographic practice cost index (GPCI) fix. The long overdue GPCI fix will update California’s Medicare physician payment regions and raise payment levels for urban counties misclassified as rural, while holding remaining rural counties harmless from cuts. The bill also delays for one year the ICD-10 medical billing coding conversion, pushing the implementation date to October 1, 2015. The California Medical Association is waiting for guidance from the Centers for Medicare and Medicaid Services on how ICD-10 will ultimately be implemented. Watch www.cmanet. org for future news regarding ICD-10 implementation. Choosing Wisely An initiative of the American Board of Internal Medicine (ABIM) Foundation SCCMA-MCMS is publishing various Choosing Wisely® lists of "Things Physicians and Patients Should Question." Choosing Wisely - see page 17 - is an initiative of the ABIM Foundation to help physicians and patients engage in conversations to reduce overuse of tests and procedures, and support physician efforts to help patients make smart and effective care choices. The American Academy of Family Physicians (AAFP) list is an endorsement of the five recommendations for Family Medicine previously proposed by the National Physicians Alliance (NPA) and published in the Archives of Internal Medicine, as part of its Less is MoreTM series. The goal was to identify items common in primary care practice, strongly supported by the evidence and literature, that would lead to significant health benefits, reduce risks and harm, and reduce costs. A working group was assembled for each of the three primary care specialties; family medicine, pediatrics and internal medicine. The original list was developed using a modification of the nominal group process, with online voting. The literature was then searched to provide supporting evidence or refute the activities. The list was modified and a second round of field testing was conducted. The field testing with family physicians showed support for the final recommendations, the potential positive impact on quality and cost, and the ease with which the recommendations could be implemented. More detail on the study and methodology can be found in the Archives of Internal Medicine article: The “Top 5” Lists in Primary Care. Don’t do imaging for low back pain within the first six weeks, unless red flags are present. Red flags include, but are not limited to, severe or progressive neurological deficits or when serious underlying conditions such as osteomyelitis Don’t do imaging for low back pain within the first six weeks, unless are suspected. Imaging of the lower spine before six weeks does not improve outcomes, but does increase costs. Low back pain is the fifth most common reason forare all physician visits. red flags present. Don’t routinely prescribe antibiotics for acute mild-to-moderate sinusitis unless symptoms last for seven or more days, or symptoms worsen after initial clinicalantibiotics improvement. Don’t routinely prescribe for acute mild-to-moderate Symptoms must include discolored nasal secretions and facial or dental tenderness when touched. Most sinusitis in the ambulatory setting is sinusitis unless symptoms last for seven or more days, or symptoms due to a viral infection that will resolve on its own. Despite consistent recommendations to the contrary, antibiotics are prescribed in more than 80 percent of outpatient for acute clinical sinusitis. Sinusitis accounts for 16 million office visits and $5.8 billion in annual health care costs. worsen aftervisits initial improvement. Symptoms must include discolored nasal secretions and facial or dental tenderness when touched. Most sinusitis in the ambulatory setting is due to a viral infection that will resolve on its own. Despite consistent recommendations to the contrary, antibiotics are prescribed in more than 80 percent of outpatient visits for acute sinusitis. Sinusitis accounts for 16 million office visits and $5.8 billion in annual health care costs. Don’t use dual-energy x-ray absorptiometry (DEXA) screening for osteoporosis in women younger than 65 or men younger than 70 with nodual-energy risk factors.x-ray absorptiometry (DEXA) screening Don’t use DEXA is not cost effective in younger, low-risk patients, but is cost effective in older patients. for osteoporosis in women younger than 65 or men younger than 70 with no risk factors. DEXA is not cost effectiveannual in younger, low-risk patients, but is cost effective in older patients. or any other cardiac Don’t order electrocardiograms (EKGs) screening for low-risk patients without symptoms. There is little evidence that detection of coronary artery stenosis in asymptomatic patients at low risk for coronary heart disease improves health Don’t order annual electrocardiograms (EKGs) or any other cardiac outcomes. False-positive tests are likely to lead to harm through unnecessary invasive procedures, over-treatment and misdiagnosis. Potential harms of this routine annual screening exceedpatients the potential benefit. screening for low-risk without symptoms. There is little evidence that detection of coronary artery stenosis in asymptomatic patients at low risk for coronary heart disease improves health outcomes. False-positive tests are likely to lead to harm through unnecessary invasive procedures, over-treatment and misdiagnosis. Potential harms of this routine annual screening exceed the potential benefit. Don’t perform Pap smears on women younger than 21 or who have had a hysterectomy for non-cancer disease. Most observed abnormalities in adolescents regress spontaneously, therefore Pap smears for this age group can lead to unnecessary anxiety, Don’t perform Pap smears on women younger than 21 or who have additional testing and cost. Pap smears are not helpful in women after hysterectomy (for non-cancer disease) and there is little evidence for improved had aoutcomes. hysterectomy for non-cancer disease. Most observed abnormalities in adolescents regress spontaneously, therefore Pap smears for this age group can lead to unnecessary anxiety, additional testing and cost. Pap smears are not helpful in women after hysterectomy (for non-cancer disease) and there is little evidence for improved outcomes. These items are provided solely for informational purposes and are not intended as a substitute for consultation with a medical professional. Patients with any specific questions about BULLETIN the items MARCH/APRIL 2014 | THE on this list or their individual situation should consult their physician. COVERED CALIFORNIA LUNCH SEMINAR FROM 12 NOON – 2:00 PM and DINNER SEMINAR FROM 6:00 PM – 8:00 PM This presentation discusses the importance of understanding the changes taking place in the individual health insurance market; the impact of the new eligibility rules on patients accessing services; and consumer cost sharing responsibilities; determination of premium assistance; current issues regarding eligibility determination; physician status in the exchange market; and other things physicians need to know to survive this first year of Covered California. Latino Health Conference Is improving health and engaging the Latino community important to you? Are you interested in learning and networking with colleagues and health care leaders about evidence based approaches to Latino health? Would you benefit from practical tools you can implement right away in your practice? We invite you to join The Permanente Medical Group, UC Davis Health Systems, and Latino Physicians of California on May 30 -31, 2014 for an innovative clinical education conference. You will not want to miss this exceptional program. REGISTER TODAY Friday, May 30 - Saturday, May 31, 2014 Santa Clara Convention Center Who should attend the Latino Health Conference? The conference is designed specifically for physicians, physician assistants, nurse practitioners, fellows, residents, and medical students. Cost: $175 for physicians, physician assistants, and nurse practitioners. Registration is free for medical students and residents. Registration includes access to all sessions, an online certificate of attendance, refreshment breaks, continental breakfast, luncheon, and hosted networking reception on Friday, May 30, 2014. CME: 11.25 AMA PRA Category 1 Creditsâ&#x201E;˘ Follow us on Twitter: @LatinoHealth14 or #LatinoHealth14 Questions? Visit the conference website at http://events.SignUp4.com/LatinoHealthConference. Contact us at Latino-Health-Conference@kp.org, or call (510) 625-6937. Statement of Disclosure: TPMG Physician Education and Development has determined that the speakers and the planning committee members for this program do not have affiliations with any corporate organizations that may constitute a conflict of interest with this program. TPMG Physician Education and Development is accredited by the Institute for Medical Quality/ California Medical Association (IMQ/CMA) to provide continuing medical education for physicians. TPMG Physician Education and Development designates this live activity for a maximum of 11.25 AMA PRA Category 1 Creditsâ&#x201E;˘. Physicians should only claim credit commensurate with the extent of their participation in the activity. physician’s office, a malfunctioning thermostat ruined $51,000 in refrigerated vaccine. Make sure you’re covered. IS THERE A MISPERCEPTION OF THE RISKS OF TONSILLEC TOMY? by Steve Kmucha, MD, JD, FACS The lay press has well-publicized a recent tonsillectomy in the local community that was associated with postoperative complications that ultimately resulted in a devastating outcome. Soon after that sentinel event, medical experts were quoted suggesting an average rate of serious or life-threatening complications after tonsillectomy with an incidence of approximately 1:25,000 operations. Tonsillectomy-Related Malpractice Awards, 1984-2012 There were 242 claims, 98 of which (41%) were fatal. Median age of plaintiffs: 8.5 years Primary causes of fatal claims were related to: • surgical factors (39.8%) • anesthesia-related factors (26.7%) • Post-operative opioid-related factors (16.3%) Primary causes of non-fatal claims were related to: • surgical factors (70.1%) • anesthesia-related factors (22.2%) • Post-operative opioid-related factors (4.2%) Sleep apnea was recorded as co-morbidity in 17 fatal and 15 non-fatal claims. Opioid-related claims had the largest awards for both fatal ($1,652,892) and non-fatal injuries ($3,484,278). Anesthesia and opioid-related claims, though fewer in number than surgical claims, are associated with larger median monetary verdicts. Monetary claims paid for non-fatal injuries was higher than those for fatal injuries. This is likely related to the ongoing medical expenses required to care for these injured individuals and the continued emotional trauma. Subramanyam R et al. Paediatr Anaesth 2014 Jan 13, pp 1-9. About the Author Steve Kmucha, MD, JD, FACS, is board certified in otolaryngologyhead and neck surgery and in the subspecialty of ear, nose and throat allergy. He also holds a law degree specializing in health and healthcare law. Brand New medical office building. Built with the highest quality materials and finishes. TIs Available. Adjacent to Good Samaritan Hosp. 3425 S. Bascom Ave, Campbell Excellent Corridor for Medical/ Dental or Professional Offices Small Atrium Suites Available with Windows, Renovated Restrooms Elevator Served. 5150 Graves Ave, W. San Jose Small medical office and fully plumbed dental office space available. TI’s Available. 14911 National Ave, Los Gatos Medical Suite Available. Great location with easy Fwy access and close to Good Samaritan Hospital. 233 Oak Meadow Drive, 3000 S. Bascom Avenue, Los Gatos San Jose Rare purchase opportunity in Los Rare freestanding corner Office/ Medical building on a 11,600 SF lot. Clean office interiors. Gatos. Attractive SBA Financing Avalable. Walking distance to DT. Medical, Dental or Retail uses Corner location with great visibility Medical Office Bldg. with established Premiere West Valley Location tenants located directly adjacent to allowed. Great Los Gatos Close to Willow Glenn & Almaden O’Connor Hospital. Flexible terms Boulevard location. Easy freeway & Campbell, Convenient Location access. Close to Good Samaritan Immediate Access to Hwy 85 and 17 Hospital . Call to tour! Medical Dental Suites Available. Close to O’Connor Hospital. Great FWY Access. Available NOW. TI’s Available. Are you in the best location? Are you paying too much for rent? save money for the hospital and our practices in the meantime – all while keeping patient safety and community health firmly in mind. answered on a case-by-case basis related to local resources and practices. However, working from the premise of avoiding excess disposable items provides a starting point. New “reprocessing” technologies exist, which make it possible to reuse single use items such as sequential compression devices, laryngeal mask airways, surgical trocars, harmonic scalpels, and pulse oximeter probes. A number of reprocessing companies will assure equipment integrity and sterility as required by the FDA, and sell these items at a price point significantly below new equipment. Such reprocessed items need to be labeled as such and tracked by the reprocessing company. In this way, data has been collected since 2002 on adverse events related to reprocessed equipment. A recent Government Accountability Office report stated that reprocessed equipment is as safe and effective as new equipment. Between 2003 and 2006, there were 434 adverse device events reported to the Food and Drug Administration, 65 of which involved reprocessed equipment, and all events were similar to adverse events found in new equipment.3 Coordination between physicians, administrators, and purchasing managers can help identify equipment that can be reused at a cost savings to the hospital, while also creating a net reduction in environmental impact. A program at the University of California, San Francisco reduced over 15,000 pounds of hospital waste and saved over $900,000 in fiscal year 2012 by implementing a reprocessing system, according to Gail Lee, REHS, MS, sustainability manager at UCSF. Donation of expired or unused items is another excellent way to reduce waste. Many such items that would be sent to a landfill can instead be used in a developing country. One such non-profit organization that collects items for use in the developing world is Medshare International (www.medshare.org). hospital waste manager is an important first step. Many machines and monitors can also be refurbished and either sold or donated to a lab, another facility, or a veterinary clinic. Medical missions will sometimes take donations of equipment. Anesthetic gases have been demonstrated to be powerful greenhouse gases.5 Nitrous oxide, in addition to being a greenhouse gas, is also destructive to the ozone layer.6 The global warming potential (GWP) for a particular gas is based on the amount of heat it captures when radiation is emitted as heat, and its persistence in the atmosphere. The atmospheric lifetime of newer inhaled anesthetics is from 1-14 years. Nitrous oxide has a lifetime of 114 years. The GWP value is on a relative scale comparing the effect of the gas with that of carbon dioxide over a specified time period. The GWP of carbon dioxide is, by definition, one. Desflurane has the highest GWP with a value of 2450, followed by isoflurane at 510, nitrous oxide at 310, and sevoflurane at 130. Since desflurane and nitrous oxide are much less potent agents than sevoflurane, higher amounts are typically used in clinical practice, which further compounds their greenhouse gas potential. The choice of anesthetic agents can therefore affect the environmental impact of anesthetic practice to a great extent. A study by Ryan and Nielsen7 compared an hour of anesthetic administration at standard fresh gas flows to emissions from automobiles and found stark differences based on the drug chosen. An hour of sevoflurane at two-liters-per-minute fresh gas flow was equivalent to driving a car about eight miles. A comparable dose of desflurane at the same gas flow was equal to driving 400 miles. The greenhouse impact of propofol is much less compared to inhaled agents,14 though wasted propofol does not biodegrade and is potentially toxic to aquatic wildlife. Changing vial sizes may mitigate wastage of propofol and save costs as well.15 Educating anesthesia departments about the environmental impact of anesthetic drugs may help anesthesia providers make more informed decisions about choice of drugs. Adjusting anesthetic techniques, such as using lower gas flows, can also conserve the amount of vapor used, and therefore released, into the atmosphere.13 Furthermore, use of regional anesthetics, whenever possible, would likely have less environmental impact. There are exciting new technologies to actually trap waste anesthetic vapor for later reuse. One company makes a filter that can be placed on the scavenger system of the anesthesia machine, which absorbs waste gases. The filters are collected and used to extract anesthetic vapor for reuse. This system is available for commercial use in Canada.8 The experience of hospitals adopting this program is that it is either cost neutral or provides a small savings. Hospitals are among the most energy-intensive types of buildings in use. Greening the O.R., from page 27 As an example, Connecticut’s Greenwich Hospital implemented a retrofit using the guide, saving 1.7 million kilowatt-hours of energy and $303,000 in costs. The retrofit required a less than six-month payback on the effort.11 Gail Lee cited another example at UCSF, in which the hospital replaced a standard chiller with an electric one, saving over 3.7 million gallons of water, 470,000 kWh, and $1.3 million in one year. A single intervention, smartly applied, can thus provide significant cost savings as well as help protect the environment. Health care facilities considering plans for new construction can follow multiple available programs available to design new operating areas for minimal environmental impact. One of the most utilized, the U.S. Green Building Council, provides a way for a facility to obtain certification under its Leadership in Environmental and Energy Design program (LEED). LEED certification consists of accumulating points in six areas of design: sustainable sites, water efficiency, energy and atmosphere, materials and resources, indoor environmental quality, and innovation and design. Points are based on a 100-point scale and the certification ranges from “certified” for 40 points to “platinum” for over 80 points. Lee says that UCSF will open a new LEED-Gold certified women’s, children’s, and cancer hospital in 2015 that addresses all these issues.16 Additional information on green design for hospitals can be obtained from the Green Guide for Health Care (www.gghc.org) and Practice Greenhealth (www.practice greenhealth.org). These groups also offer programs for “green renovations” in existing hospitals. time and considerable up-front effort. However, recruiting a group of dedicated staff members makes carrying the load much easier. Keep goals simple, at first. Make small changes. Work on just recycling waste, or just limiting desflurane, or just reducing unnecessary equipment in surgical kits or your individual workplace. Remember that this is just as much a cultural change as it is a change in practice – even small changes have a positive psychological impact. Greener operating room practices are becoming increasingly popular and common in hospitals, both large and small, can save a significant amount of money, and are well worth the effort in the long run for the health of our patients, health care systems, and communities. 1. Intergovernmental Panel on Climate Change: Climate Change 2013: The Physical Science Basis, Nov 2013, pp TS5-TS10. 2. Chung JW, Meltzer DO. “Estimate of the carbon footprint of the U.S. health care sector.” JAMA 2009; 302(18):1970-1972. 3. United States Government Accountability Office. Report to the Committee on Oversight and Government Reform, House of Representatives: Reprocessed Single-Use Medical Devices: FDA Oversight Has Increased, and Available Information Does Not Indicate That Use Presents an Elevated Health Risk Washington, DC: United States Government Accountability Office; 2008. 4. McGain E, Hendel SA, Story DA “An audit of potentially recyclable waste from anesthetic practice” Anaesth Intensive Care 2009;37(5):820-823. 5. Sulbaek Andersen MP, Nielsen OJ, Wallington TJ, Karpichev B, Sander SP “Medical intelligence article: assessing the impact on global climate from general anesthetic gases” Anesth Analg 2012;114(5):1081-1085. 6. Ravishankara AR, Daniel JS, Portmann RW “Nitrous oxide (N2O): the dominant ozone-depleting substance emitted in the 21st century” Science 2009;326(5949):123-125. 7. Ryan SM, Nielsen CJ “Global warming potential of inhaled anesthetics: application to clinical use” Anesth Analg 2010;111(1):92-98. 8. Gupta D “Capturing Greenhouse Inhalation Anesthetics for Better City Atmosphere” WebmedCentral ANAESTHESIA 2012;3(5):WMC003397. 9. U.S. Energy Information Administration, Commercial Buildings Energy Consumption Survey, 2003. 10. U.S. Department of Energy, Advanced Energy Retrofit Guide Healthcare Facilities, September 2013. 11. Connecticut Energy Efficiency Fund, Case Study-Greenwich Hospital, www.CTEnergyinfo.com. 12. Practice Greenhealth. “Greening the OR:Guidance Documents” http://www.c4spgh.org/HCW1_Presentations/GOR_Fullset_ Guidance%20Docs_Web_042711.pdf. 13. Feldman JM “Managing Fresh Gas Flow to Reduce Environmental Contamination” Anesth Analg 2012 May ; 114(5): 1093-1101. 14. Sherman J, et al “Life Cycle Greenhouse Gas Emissions of Anesthetic Drugs” Anesth Analg 2012 May; 114(5): 1086-90. 15. Mankes R “Propofol Wastage in Anesthesia” Anesth Analg 2012 May; 114(5):1091-2. 16.	http://missionbayhospitals.ucsf.edu/about-project/sustainabilitystory. Responding to Online Negative Comments By Josh Hyatt With the advent of social media and online marketing outlets, physicians, health care practitioners, and facilities are experiencing, in a new medium, a not-so-new phenomenon — bad publicity. There are many online sites that allow patients to rate their physicians on various scales, and oftentimes they can leave narratives about their experiences. “Dozens of websites that permit people to rate, review, spin, or flame their doctors have sprung up in the last year, operating in much the same way as online services that help people find the best hotels or avoid plumbers who overcharge,”1 reported the Los Angeles Times in 2008. As such websites increase in popularity, so does the significance of such ratings. Many patients are using the sites to report negative comments about physicians, and physicians often feel unable to defend themselves due to HIPAA and other privacy regulations. Negative reviews can come from angry patients, disgruntled employees, and sometimes even members of the public just trying to create unsubstantiated problems. When these attacks occur, sometimes the physician wants to go into a defensive mode to preserve both integrity and reputation. But impulsive responses may do more harm than good. Because negative online reviews can affect a physician and his or her practice, the issue warrants a two-fold plan of action that is both proactive and reactive in nature. •	Setup your own practice web page where you can control the content and message you want to share with the community. Work with your group administrator or medical director, as necessary. •	Develop a social media plan for your practice. This could include Facebook or Twitter accounts where postings can be controlled. •	Periodically check websites for yourself or your practice to identify any specific issue or trends. You may want to explore setting up online alerts that advise when comments have been posted about you as a physician. •	Ask patients to go online and rate your services. Positive ratings will help to counter-balance negative comments. •	Provide a patient complaint process so disgruntled patients can receive timely resolution. comments, potentially leading to litigation. •	If you feel the information is “clearly false, inappropriate, and solely inflammatory, contact the (Internet) site administrator.”2 Legitimate sites have content guidelines and will probably remove information that violates them. •	If you are considering suing a reviewer, there are many potential issues you need to be aware of to avoid pitfalls and countersuits. Consult with your attorney as soon as possible, before taking any steps in that direction. •	Periodically follow up with positive information about your practice on the sites. NEVER post fake consumer reviews, as this may result in significant fines and penalties. •	If you choose to respond in writing, limit the response to general information, NEVER use patient identifiers or reveal any protected health information, and do not directly or personally attack the individual posting the comment. 1. Roan, Shari. The Rating Room. Los Angeles Times. May 19, 2008. 2. California Medical Association. CMA On-Call, Document 0822: Online Consumer Review and Rating Sites, www.cmanet.org. This article has been adapted from “Responding to Online Negative Comments,” one of 100+ risk management articles, sample forms, and sample policies available online to NORCAL Mutual Insurance Company policyholders. Josh Hyatt is a Risk Management Specialist with NORCAL Mutual. Copyright 2012. ?u=01bf7589494a7e0529ade7063&id=c4a59663 5a) on current topics related to physician health to everyone in its growing network. CPPPH also helps hospital medical staff committees with information and examples of how to address the issues that all physicians face now, including burnout and all the increasing stresses: http://cppph.org/proactive-approaches-to-physician-health-and-wellness/. The SCCMA Physicians Well-Being Committee invites comments from everyone in the SCCMA medical community about these activities. Contact the SCCMA committee (pjensen@ sccma.org) or contact CPPPH through “contact us” on its website: http://cppph.org/contact-us/. manifestations of inappropriate behavior represent an ongoing pattern that is pervasive, deep-seated, and resistant to change. Expected behavioral standards have been established by professional organizations and, when incorporated in medical staff policy, may prevent and/or redress disruptive physician incidents. When pervasive violations of behavioral and interpersonal norms persist and medical staff attempts to mediate are met with physician resistance, denial, and even aggressive responses, consideration should be given to referral for in-depth professional evaluation of the physician. The feasibility of offering assistance should be considered before automatically invoking discipline. Comprehensive evaluation determines a diagnosis, identifies contributing causes, and formulates a specific remediation and monitoring plan for the individual physician. The goal of remediation does not involve silencing physicians. Instead, physicians should be assisted in learning techniques to express concerns about real problems in professional ways. In all cases, a balanced, respectful, and compassionate perspective toward both perpetrators and their targets should guide the work of hospitals and medical staff committees, while having to set appropriate limits—a “tough love” approach aimed at constructive problem solving and remediation whenever possible. The full article “Disruptive Physician Behavior: Use and Misuse of the Label,” Journal of Medical Regulation, Volume 98; No 1, 2012 can be downloaded at the FSMB website (http://www.fsmb.org/pdf/pub-jmrmisuselabel.pdf). Or, for a reprint of the article, contact Dr. Norman Reynolds directly at 408/264-3064 or by email at cpcs2001@hotmail.com. Governance Reform: CMA Envisions a New Future for Organized Medicine By Steven E. Larson, MD, MPH Chair of the CMA Governance Technical Advisory Committee Change is never easy. But oftentimes it is necessary, and even invigorating. The California Medical Association (CMA) is about to embark on a journey of change that will position our association as a nimble, proactive organization ready to lead the practice of medicine into a brave new world. In 2013, the CMA House of Delegates (HOD) approved a plan to reform the way our association is governed. Will it be easy? No. Will it be worth it? There is not a doubt in my mind. In a nutshell, the reforms will make CMA more relevant and effective by focusing the association on, and bolstering its resources to address, the critical issues of universal importance to physicians. By doing so, CMA will be better able to protect the interests of its physician members and, even more importantly, guide the future of our profession, not only in California, but nationwide. The full report of the CMA Governance Technical Advisory Committee, as amended by the House of Delegates at its October 2013 meeting in Anaheim, is available for download on the California Medical Association website. To access the report, available to members only, visit www.cmanet.org/hod and click on the “documents” tab. The report begins on page 12 of the “Actions of the 2013 House of Delegates” document. to us that the rank-and-file members want more advocacy, while the delegates and trustees are heavily invested in leadership. by 15-minute limits on debate of recommendations developed in a rushed overnight exercise, as is currently the case. More focused expertise would be brought to bear in a more careful development of recommendations for action. Policy on other issues would realize the same benefits of a more careful and expert deliberative process throughout the year. We would like to improve the discussion at the House of Delegates to deal with the big issues of the day and to utilize the valuable resources of our delegates for the collective development and direction of important policy matters. We believe this proposal has real potential for a robust discussion around issues that will impact all physicians. The reforms would also open the discussion to individual members who could continue to bring forth their ideas and proposals through a year-round resolution process provided for in the CMA bylaws. Such proposals would be studied, with recommendations acted on by the board. A year-round dialog about timely issues should result in well-thought out policy pieces that could be brought to the floor during HOD. This year’s discussion and debate at HOD on governance reform has set the stage for the GTAC to make proposals to modify the bylaws to begin the changes needed to set CMA’s course for the next 150 years. I am optimistic that this will result in an improvement for our entire organization. It will make CMA more effective in reaching the average member and give them a direct voice in policy, bringing broader input into our more difficult decisions. Dr. Larson, a Riverside physician, has served as chairman of CMA’s Board of Trustees since 2011. He is also the chair of CMA’s Governance Technical Advisory Committee. Gaither said sugary drinks are the biggest contributor of added calories in the American diet, responsible for 43% of the 300 additional calories added to the average American’s daily consumption since the 1970s. He got the idea for a bill that would mandate a warning label for sugary drinks from the students he taught in his high school science class. Teaching in a low-income public school in San Jose, Tom Gaither, now a first-year medical student at the University of California, San Francisco School of Medicine, said students were allowed to bring drinks to class— and many of them brought sugar-laden sodas and energy drinks. “So many of the kids didn’t know how bad sugary beverages were for them,” says Gaither. The Indiana University graduate chose to teach science in public school, in between undergraduate school and medical school, as part of the “Teach for America” program, a nonprofit that places high achieving undergraduates in schools with high levels of poverty. His idea for the bill was part of a California Medical Association (CMA) contest for medical school students and residents. The contest, called “My CMA Idea,” collected ideas for public health legislation from medical students and residents, allowing future physicians to help craft public policy to improve the health of all Californians. All physicians were invited to vote for and comment on their favorite ideas. Gaither’s idea was selected from the top-ranked ideas and through this legislation the idea will, hopefully, become a reality. Most kids that attend inner city schools have higher rates of obesity and drink more sugary drinks, he says. The health implications are felt most acutely by California’s communities of color, which are the largest consumers of sugary drinks. One in three children born after 2000 – and nearly half of Latino and African-American children – will develop type 2 diabetes in their lifetime. The fact that his students didn’t know that these drinks could be unhealthful prompted him to organize a unit within his regular science class about the effects of diet, particularly sugar, on health. “The science on sugary drinks is very clear,” he says. “I thought this was a good way to start a dialog about these drinks,” he said. He hopes that by labeling sugary drinks as hazardous to health that the public will come to understand that choices about food, like smoking tobacco, are important. topically to cause burning and redness of the skin (poulticing). Although not in Dr. Cory’s diary, quinine was a very popular treatment for fevers of any etiology. Doctors of the day made a very decent living. Income from medical practice was $75.00 - $100.00 per day. Office visits were two ounces of gold dust ($32.00 dollars). Laudanum charges were one dollar per drop and quinine one dollar a grain. These prices were not out of line as boots sold for $40.00 a pair, potatoes, a dollar a pound, and a haircut was five dollars. Surgery in 1849 was in its infancy. Anesthesia was either whiskey or laudanum, with or without restraints. Morbidity and mortality rates were unacceptably high. Most surgeons were restricted to setting fractures, draining abcesses, and performing amputations. It would be a few years before anesthesia (ether and chloroform) and aseptic technique would lower morbidity and mortality rates and allow general surgical procedures to become more commonplace. The gold rush physician relied on his savvy and his senses, plus an array of chemicals and botanicals to bring relief to the suffering. He gave it his best with what he had to work with. A new, innovative, state-of-the-art medical museum is being planned at SCVMC. It is a joint project with SCVMC and SCCMA. We are looking for any medical artifacts or antiques that would be connected with any medical or surgical field. Equipment, books, displays, instruments, etc., would be welcomed. If you wish to donate any of the aforementioned items, please contact Michael Shea, MD, at 408/2685820 or md6996@sbcglobal.net. Help Create an AIDS-Free Generation Include routine HIV testing for all patients, regardless of their risk status, starting at age 13. HIV screening is recommended for all patients in all healthcare settings. Persons at high risk for HIV infection should be tested at least annually. For information or to view a video on how to incorporate routine testing into your practice, please scan the QR code or visit http://bitly.com/ bundles/prxinc/2. State-of-the-art medical space available to share on Bascom and White Oaks. Up to three exam rooms with shared common areas. Ideal for primary care or specialist. For more information, please contact Davina at Age Defying Dermatology at 408/369-4210. triple net and monthly H/O dues. Two doctors set up. Three examination rooms. Approximately 1,100 sq. ft., furnished or unfurnished, adequate parking, walk to Regional Med Ctr. Close to X-Ray and lab. Previous tenant doctor retired. Call Marie at 408/268-2040. employees. We can provide either an employment relationship including full benefits or an independent contractor relationship. Please contact Rick Flovin, CEO at 408/228-0454 or email riflovin@allianceoccmed.com for additional information. Beautiful medical office across from Palo Alto Medical Foundation. Professional office with vaulted ceilings, new interior, digital x-ray, natural light, and Wi-Fi. Trained receptionist to schedule patients, make reminder calls, collect paperwork and insurance info. Rent exam room one to five days per week, excellent office – low overhead. Call 650/814-8506. Sunnyvale Dermatology (Dr. Bernard Recht) is looking for a part-time Dermatologist. We are a well established, busy office and we are looking for someone to work one to two days per week. Please email your CV to judy@sunnyvalederm. com. 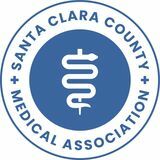 Salinas Pediatric Medical Group, Salinas – seeks an experienced Practice Manager with Accounting/Finance, HR, and Office Administration experience. Degree, plus five years relevant work experience required, including supervision of staff. Great stable work environment, competitive comp, including bonus potential. Email resume and cover letter, including salary expectations to lauralj@tpohr.com. collaborative way with the Counseling Program at SJSU and with individual counselors in this department. Link to Apply to the Position: http://apptrkr. com/448016. The car has flawless black paint with black full leather interior trim. This six-speed manual 911 Carrera 4S is in exceptional condition, garaged, fully loaded…the ultimate driving experience! This is a low mileage (30,000) C4S Cab in pure Porsche Black on Black, $45,000. For more information, contact Bill Parrish, 408/529-1856. Report says CURES database provisions in MICRA ballot measure “cannot be implemented” On March 13, the Patients, Providers and Healthcare Insurers to Protect Access & Contain Health Costs campaign released a report that raises serious doubts about whether a key provision of the trial lawyers’ proposed anti-MICRA ballot measure can be feasibly implemented. Even worse, according to the report, the ballot measure would put physicians and pharmacists in the impossible position of choosing between denying or delaying needed prescription medication to legitimately suffering patients and violating the law. In addition to more than quadrupling MICRA’s cap on non-economic damages, the trial attorneys’ proposed initiative would require licensed health care practitioners and pharmacists to consult California’s Controlled Substance Utilization Review and Evaluation System (known as CURES) database prior to prescribing or dispensing Schedule II or Schedule III controlled substances to patients. The non-partisan report found that although this system has the potential to allow prescribing health care providers to check on the relevant prescription drug histories of their patients, as required by the proposed initiative, in practice it lacks important functionality needed to allow doctors and other prescribing health care providers to comply. According to the report, the CURES database, without a major change to its currently proposed timeline for upgrades and improvements, would be unable to accommodate the more than 200,000 new users that would need to be added in order for the system to be universally utilized. prize drawing. The election of board members will take place at the Annual Meeting of Members held on May 31, at NORCAL Mutual headquarters in San Francisco. All votes must be received by May 26 to count towards the quorum. This bill would prohibit health service plans from executing agreements with physicians that contain provisions requiring them to participate in all networks or products that are currently offered or that may be offered by the health plan. The bill would allow physicians to opt-in in each network or product. This bill would restore the 10% cut to Medi-Cal provider reimbursement rates that was enacted as part of the 2011 State Budget Act. It seeks to bolster provider participation in the Medi-Cal program as the State implements the rollout of health care reform. This bill would appropriate funding to graduate medical education programs in primary care specialties (internal medicine, pediatrics, obstetrics and gynecology, and family medicine) to ensure an adequate and properly distributed supply of physicians, immediately and over the long term. cal year 2015-16, and would appropriate $1 million to begin the planning effort for the establishment of a medical school at UC Merced. This bill seeks to increase the capacity of California’s health care system to provide quality, physician-led access to care. It would change current law to allow a physician to supervise up to six (current limit is four) physician assistants, nurse practitioners, or certified nurse midwives at any moment in time. This bill would require health insurance companies licensed in the State of California to pay physicians for telehealth services, including telephone, or other electronic patient management. The bill would adopt the Health Information Technology for Economic and Clinical Health (HITECH) Act as the standard for health care data breaches and move state law closer to federal law. CMA will also take a position on hundreds of additional bills over the course of the next few months. CMA’s Council on Legislation (COL) will be meeting in Sacramento to discuss the association’s legislative priorities for 2014. COL is composed of more than 60 physicians from around the state who are nominated by their delegation, county medical society, or specialty society, and meet annually to discuss and recommend CMA’s positions on numerous pieces of legislation pertaining to the house of medicine. All of the recommended positions taken by COL will be presented to the CMA Board of Trustees for finalization at its April 15 meeting. These then become CMA’s official positions throughout the current legislative cycle. CMA attends California Democratic, Republican Party Conventions to showcase health care efforts The California Medical Association (CMA) sent a large contingent of physicians, medical students, and staff to the California Democratic Party Convention in Los Angeles, March 7-9. As the trial lawyers are major Democratic party financial contributors, our presence was critical to the ongoing battle over the Medical Injury Compensation Reform Act (MICRA). Joining the group of 3,000 California Democratic delegates and guests, CMA’s physicians and medical students, donning their crisp white lab coats, had a major presence. Roaming the halls, lining the backs of caucus rooms, and speaking to delegates, CMA’s representatives were the talk of the convention. All	websites,	links,	and	promo	codes	are	case-­sensitive. Many	more	discounts	available,	call	Danielle! NORCAL Mutual is owned and directed by its physician-policyholders, therefore we promise to treat your individual needs as our own. You can expect caring and personal service, as you are our first priority. For more information contact a NORCAL Mutual broker.